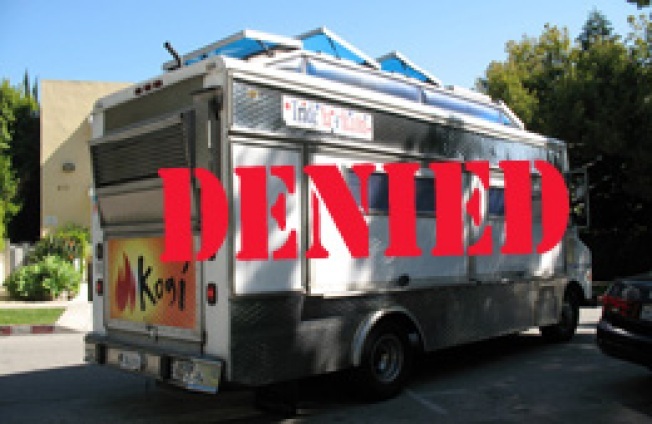 Orange County: Really, it was only a matter of time before the health department—any health department—made headlines by cracking down on this current wave of new street food vendors. And it just so happened that the biggest fish in the pond, Kogi, is on the receiving end of the Orange County Health Care Agency's wrath. Kogi chefgod Roy Choi tells Fast Food Maven that the Korean BBQ truck never got the proper permits to sell food in the OC, so they've been asked to leave and not come back without the proper paperwork. The crackdown comes in the wake of an Old Towne Orange visit that produced three-hour waits. But though everyone seems to be playing nice, whether or not Kogi will actually jump into the process remains to be seen. The permitting process can take several months, but it sounds like Choi and his merry band are sold on it and would rather go to the edge of the OC-LA countyline instead: "Choi doesn’t see the point [of the permits]. His company is based in L.A. and his business partners have gotten permission from local agencies to roll their trucks into certain Orange County cities over the last few weeks."